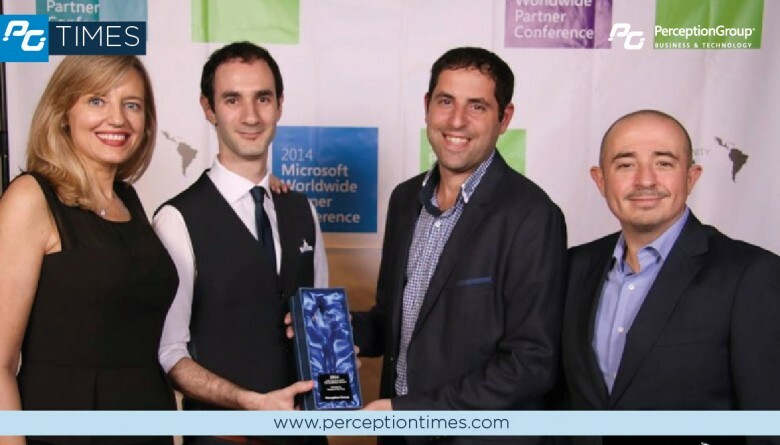 Perception Group has been recognized with the Messaging Partner of the Year 2014for the LATAM & Caribbean region, in the Microsoft Worldwide Partner Conferenc in july. This recognition, designed for partners’ prominent work on corporative mail migrations, focuses on PGs efforts and dedication to the development and deployment of Office 365. Jonathan Saiegh (@jsaiegh) and Gastón Zelerteins, (@gzelerteins), founders and CEOs of Percpetion, can be seen in the picture, together with Fabricia Degiovanni, President of Microsoft Argentina, and Roberto Icasuriaga(@Robertouy), business regional partner manager. The event was held on July 13th and was attended by more than 16000 guests from 140 different countries. The award adds up to past recognitions Perception has had, given its work in the whole region during the last few years.